1. If there is no access to electricity at your ceremony site, choose instruments that don’t have to plug in. Strings, woodwinds, bagpipes, and brass instruments work great because they don’t need electricity. 2. Solo guitar or solo harp can be effective for smaller outdoor weddings, where the bridal party and guests are seated or standing fairly close to the musician. These instruments are not very loud, so the music doesn’t carry very far, but it’s beautiful. 3. 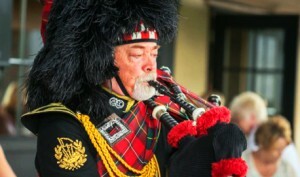 If you expect cooler temperatures (below 65 degrees Fahrenheit) consider Brass instruments or Bagpipes. These can play in somewhat lower temperatures than strings or woodwinds. 4. Choose instruments that excel at the style of music you want for your ceremony. String Quartets, String Trios and Harpists are experts at classical music, and many can also perform pretty popular tunes. Some Guitarists perform pop/folk, some perform classical, and some perform jazz. (It’s rare for a guitarist to play all three styles.) Brass groups are great for the “pomp and circumstance” style of classical and traditional music. 5. Choose instruments that are visually beautiful–they can enrich your ceremony photos. For example, the Harp is exquisite (what a photo op: picture glowing bride next to the angelic harp!) Violins and cellos are visually gorgeous, and a silver or gold flute definitely looks classy. This entry was posted in Uncategorized and tagged best musical instruments for outdoor weddings. Bookmark the permalink. Follow any comments here with the RSS feed for this post. Both comments and trackbacks are currently closed.